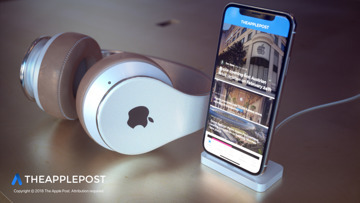 Following the rumors of Apple's launch of branded over-the-ear headphones, new images depicting a concept version of the Apple headgear have been produced, showing what the supposed product could look like if it launches this year. 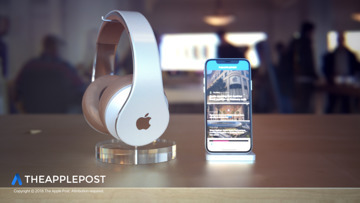 The concept images published by The Apple Post borrows heavily from the over-ear headphones produced by Beats, the Apple subsidiary that is already dominating the headphone market with its own brand of premium audio accessories. The overall shape is identical to the Beats Solo Wireless and Beats Studio Wireless headphones, with a large headband and round areas where the cup sections attach inside. The version shown replaces the Beats logo on the side of the headphones with Apple's logo, on top of a seamless white outer casing. The edge of the white headband is shown as having a metallic appearance, and a light brown leather is used for the headband's lining and earpads. A small hole is also visible on one earcup, near to where the user's mouth would be located. Presumably this would be for an enclosed microphone, used to summon Siri or for making phone calls. 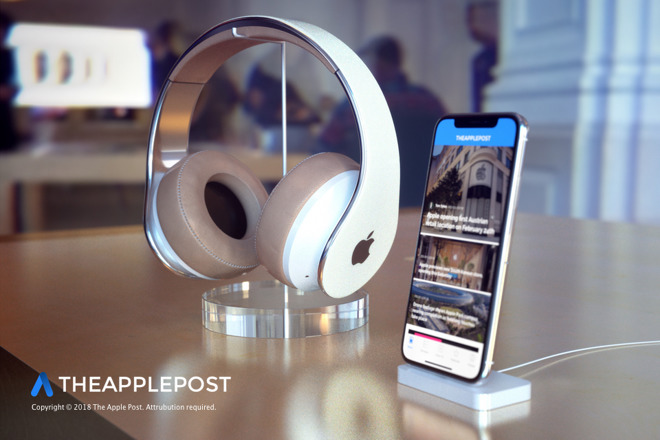 Last week, KGI analyst Ming-Chi Kuo made the prediction Apple would debut a branded high-end, over-ear headphone featuring an "all new" design, which is speculated to ship in the fourth quarter of 2018. According to Kuo, Apple is keen to deliver a product that provides the convenience of AirPods, but with better acoustic qualities. Kuo also believes Apple will introduce an updated version of the AirPods in the second half of 2018, speculation shared with other rumors about the popular audio accessory. While the overall design will be the same as the original, this second iteration will apparently center around internal component upgrades to the W1 chip and an inductive charging case, with Apple thought to use new manufacturing methods that take into account the accessory's wireless charging capabilities.